FatWallet features seasonal savings with exclusive coupons on tools, clothing, tech gadgets and outdoor sports gear men rate highest, including the bonus of increased cash back rewards. The short break between Mother’s Day and Memorial Day sales is a smart time to look for hidden savings on seasonal items for men. 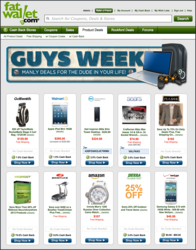 FatWallet.com presents Guys Week, offering online bargain hunters a convenient one-stop to find seasonal discounts and early Father’s Day gift savings on tools and outdoor gear men want this year. The promotion, from May 13-19, features exclusive coupons and deals on everything from sports and outdoor equipment to power tools, laptops, tablets and clothing. FatWallet lists thousands of manly bargains from hundreds of top retail stores like Radio Shack, Jos A Bank, Dell, Webroot and Bowflex that are offering shoppers the added savings of cash back rewards for FatWallet members. This week, online shoppers will find some of the best up-to-the-minute tech deals and mens apparel discounts shared in the FatWallet Hot Deals forum by fellow consumers. The site features hundreds of daily added offers on smartphones, tablets, exercise equipment, hunting and fishing gear and more. Early Father’s Day shoppers can also find the top local deals in their city saving 50% or more on gift certificates to restaurants, movies, events and services dads would use. About FatWallet: As the preferred online shopping resource for millions of smart consumers looking to save, FatWallet.com works closely with 1,500+ retailers like HP, Newegg, Kohl’s and 6PM to publish special offers, discounts, coupon codes and Cash Back rewards to its members. The much celebrated FatWallet forums represent the pulse of an evolving online marketplace where smart consumers gather to share and learn. FatWallet is owned by Performance Marketing Brands (PMB) who owns and operates the world's most rewarding shopping programs. Through its family of distinct websites and reward programs, Ebates.com, FatWallet.com and AnyCoupons.com, PMB users can get a great deal and earn money back every time they shop. PMB shoppers are expected to spend over $2 billion through PMB's websites and shopping programs.